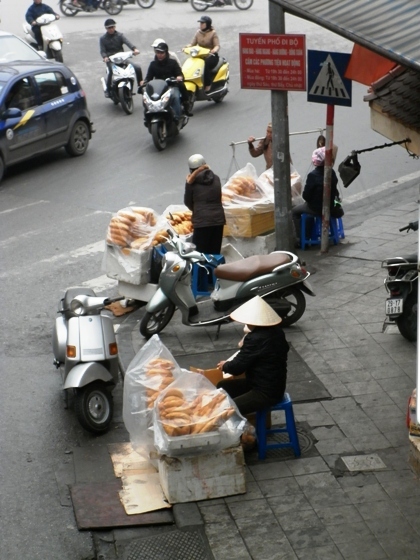 A short flight with Vietnam Airlines takes us from Hue to Hanoi – the capital of Vietnam. Compared to hot and steamy Ho Chi Minh City, Hanoi in mid-February is cold, overcast and drizzly – one morning it gets down to 11 degrees C and we’re still cold, even wearing four layers of clothing. Other Australians in the Hanoi cold are identifiable by their outfits of shorts, T-shirts and thongs. Our hotel is in the Old Quarter and the surrounding area is more crowded and has more dangerous traffic than Ho Chi Minh City – which is saying something. It is impossible to walk directly along any footpath or roadside due to myriad motorcycles and motor scooters. Wall-to-wall tiny shops line the footpaths, selling clothes, footwear, camping gear, electronics – you name it. There is no noticeable copyright law in Vietnam so many of them stock well-known brand name products, cheap. A local tells us the goods are often sourced from the same sweatshops that the big brand names use. And there is even a relic of French colonialism as on the street corners old ladies sell baguettes by the dozen.